Rainforest in Brownsberg, Suriname. Photo by Rhett A. Butler The Guiana Shield region of South America could play a significant role in efforts to fight global warming as part of a broader strategy to protect the world's biodiversity hotspots and high biodiversty wilderness areas, said a leading conservationist speaking in Paramaribo, Suriname at a gathering of tropical biologists. In an address to the annual meeting of the Association for Tropical Biology and Conservation (ATBC), Conservation International (CI) President Dr. Russell Mittermeier said the largely intact forests of Suriname, Guyana, and French Guiana serve as a refuge for biodiversity and a massive store of carbon. Protecting these forests could help reduce the risk of global mass extinction and offset the worst effects of climate change, he said. 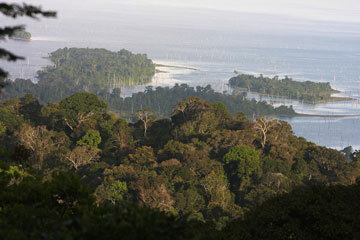 "The [Guiana Shield] has the most intact rainforest on the planet," he said. "It's really a region that has all of its options left." Mittermeier pointed to the emerging policy mechanism known as REDD or Reducing Emissions from Deforestation and Degradation as a potential way to fund tropical conservation efforts. Because deforestation accounts for around a fifth of global greenhouse gas emissions — more than the entire transportation sector — efforts to reduce deforestation can help fight climate change. While REDD was explicitly excluded from the Kyoto Protocol, policymakers meeting at climate talks in Bali last December signaled that forestry would play a role in future emissions mitigation schemes. Mittermeier noted that Guyana president Bharrat Jagdeo has already offered up his country's forests for permanent protection by an international body in exchange for development aid and technical assistance. Meanwhile several REDD initiatives are already in development, including a CI project on the island of Madagascar. Mittermeier said CI is in talks with the government of Liberia to establish a carbon conservation program. The West African country — ravaged after years of war — contains one of the few remaining expanses of Guinean forest, a critically endangered biodiversity hotspot. A previously unknown species of Atelopus toad discovered on the Nassau plateau in Suriname. 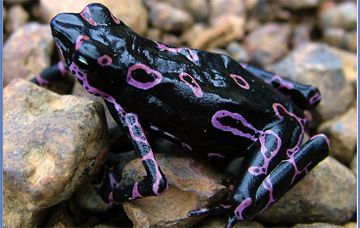 Atelopus toads have been particularly affected by the deadly chytrid fungus. Photo © Paul OuboterMittermeier is also encouraged by increased private sector involvement in conservation, including green initatives by some of the world's largest companies. He said that while some conservationists have reservations about working with corporations, it is a necessity given their impact on the environment and role in the global economy. "If you don't change with the private sector, you probably aren't going to be successful," he said, adding that Wal-Mart's environmental efforts have gone from being simply a marketing campaign to becoming a central component of the company's strategic business plan. Mittermeier said that while conservation efforts will continue to be challenged by forest loss and other threats, scientists should remain hopeful for the future. "We need to be optimistic," he said. "We have a real opportunity to do something of lasting and historic value but we have only a limited time to do it." Article was published by Mongabay.com. With more than 80,000 unique daily visitors, Mongabay.com is one of the world's most popular environmental science sites. The news and rainforests sections of the site are widely cited for information on tropical forests, conservation, and wildlife. Mongabay.com aims to raise interest in wildlife and wildlands while promoting awareness of environmental issues. Originally the site was based around a text on tropical rainforests, but today the site has expanded to other topics (like Madagascar [WildMadagasacar.org]) and is available in versions for kids and in about two dozen non-English languages. An earlier article by Dr Mittermeier: $230B for space mission but only $30M for deep ocean research?